The front has a degree scale on the limb 0 to 360 divided to 5, subdivided to 1, numbered by 5. 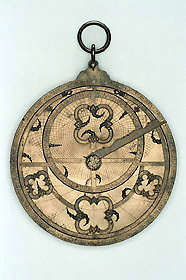 Riveted back plate with meridian and east-west lines and circles for the tropics and equator. Throne, shackle and suspension ring. Rete for 21 stars, not named. The ecliptic circle is marked with the names of the zodiacal constellations, each divided 0 to 30 by 5, subdivided on the bevelled edge to 1, numbered by 5, with division lines radiating from the centre of the rete (the pole). The design has four prominent quatrefoil shapes and 'wavy flame' star pointers, four within the quatrefoil placed within the ecliptic. Each end of the band for the Tropic of Capricorn terminates with a hand and elaborate cuff. The other elements in the rete structure are a broken meridian bar within the ecliptic, an east-west bar counterchanged twice, a broken half-equator and two links between the ecliptic and Tropic of Capricorn each comprising four circles with flowers. Shaped rule decorated with stars, pin with shaped nut and washer. There are two latitude plated, engraved for 36, 41 and 45, 49, with latitudes marked. There are almucantars and azimuths for every 3 degrees; on the projection 45 degrees only the almucantars up to 66 are numbered and the eastern side of the horizon line is marked 'ORIGENS'. Each projection has meridian and east-west lines, equator and tropics and unequal hour lines beneath the horizon. The back has a degree scale on the limb, numbered 90 (at the throne) to 0 to 90 to 0 to 90, divided to 5, subdivided to 1, numbered by 5. The same divisions serve for the 0 to 30 division for each zodiacal sign named on the inner side of the scale, each sign thus with a scale 0 to 30, divided to 5, subdivided to 1, numbered by 5. Inside this scale is an eccentric calendar scale, with the names of the months in Latin, each with a scale for the appropriate number of days, divided to 5 (adjusted to the days in the month), subdivided to 1, numbered by 5. The first point of Aries is at 11 March. Within this scale is a diagram for unequal hours in two quadrants, with the hours numbered 1 to 6, 6 to 1, and a double shadow square with scales 0 to 12 to 0 to 12 to 0, divided to 2, subdivided to 1, numbered by 2. Alidade with double pinhole sights. Formerly in the Henri Michel Collection, then the J. A. Billmeir Collection. See C. H. Josten, A Catalogue of Scientific Instruments from the 13th to the 19th Centuries from the Collection of J. A. Billmeir (Oxford, 1954), p. 13 (with plate III).